Universal Cool Japan is celebrating its fifth anniversary this year by bringing us another slew of thrills and entertainment. Eight new attractions will be rolled out in 2019, inspired by the world's of some of Japan's most popular characters from pop culture! Here's what's in store for anyone visiting Universal Studios Japan this spring! What is Universal Cool Japan? Universal Studios Japan—or USJ, for short—is the Japanese edition of one of the world's most famous global theme park chains, and is located in Osaka. The overall theme of USJ revolves around the movie production powerhouse Universal Pictures, and the multitude of classic film franchises and iconic heroes that they have brought to our screens—Jurassic Park, King Kong and Back to the Future, to name but a few. The concept of Universal Cool Japan is to bring new, immersive attractions to the theme park that are inspired by the cool Japanese pop-culture brands known around the globe. 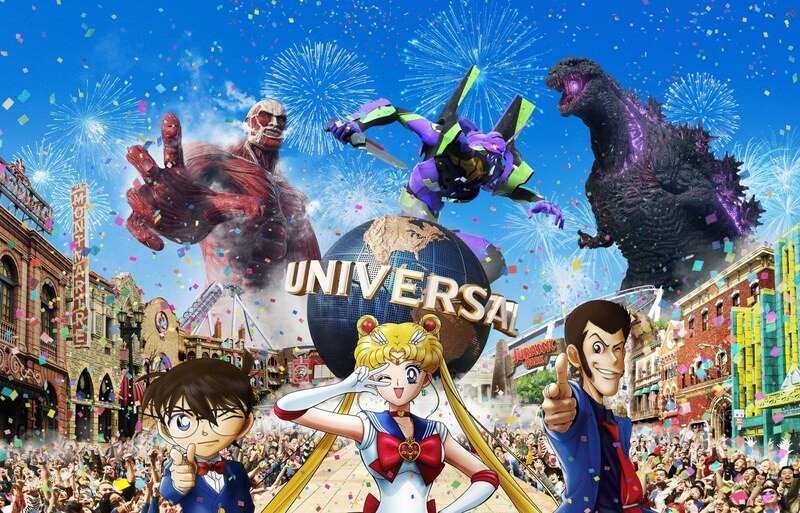 Universal Studios Japan stated in their official Universal Cool Japan 2019 news release that it "immerses guests in the worlds of internationally admired and "cool" entertainment brands." 2019 is also the event's fifth anniversary, and they decided to celebrate in style with their biggest year to date, as eight new and diverse attractions will be rolled out over course of 2019. Universal Cool Japan 2019 is split up into two seasonal terms, spring and summer. Two of Japan's most famous anime and manga series', Detective Conan and Lupin III, are the stars of the show in the spring term, which will last from Friday, January 18 until Sunday, June 23, 2019. This includes Detective Conan's Real Escape Game, Park Rally and entertainment restaurant. Along with an XR Ride and another entertainment restaurant experience from the world of Lupin III. We were fortunate to get the chance to check out a couple of the these marquee attractions the day before Universal Cool Japan 2019 officially opened to the public. Here's how the day panned out! The walkway leading to the gate of Universal Studios is clearly designed to elicit goose bumps. As I made the short stroll from Universal City Station towards the park, a real sense of excitement began to kick in. The sky-high palm trees fluttered in the breeze, the iconic Universal Studio's arch towered in the sky, a grandiose musical fanfare blared from the park's sound system, and in spite of the frigid bite of a mid-January morning (one of the biggest distinctions from Universal Studios Hollywood) , it was a beautiful day. The front section of the theme park is designed to look like a mash-up between the streets of a hyper-stylized American town and a classic Hollywood film studio lot, with a sprinkling of movie icons for good measure. It really does feel like you've temporarily left Japan, which is a testament to both USJ's design and its implementation. After entering the park and meeting the rest of the press team joining in on the fun, we were quickly debriefed and escorted off towards our first order of the day. The photo shoot was essentially a preview for Detective Conan's Real Escape Game attraction (more on that later), which is making a return to the park in 2019 with brand new content after a two-year hiatus. The Real Escape Game uses the tried and true formula of a classic escape room attraction, but spices it up with a Conan-themed twist, which involves a backstory and one dastardly villain—Kaito Kiddo, the Phantom Thief Kid—who has been plaguing titular hero Conan for years. I wrestled a little with my camera in attempt to turn the flash off at the coordinator's behest before managing to get a few snaps of the Phantom Thief Kid in the flesh. As usual, the villain was adorned in his vintage paper-white suit, elongated top hat and mysterious monocle, with the cerebral protagonist Conan peering over his shoulder. The shoot was kept short and sweet, and before I knew it I was en route to the Universal Cool Japan 2019 opening ceremony! Cameras in tow, we were shuffled into the media area of a large black-paneled studio hall where a Universal Cool Japan billboard with giant, illuminated characters from the world of Japanese pop-culture dominated one quarter of the room's wall space. In front was a central podium surrounded by a crowd of dancers that was at least 150-strong, who appeared to represent almost as many individual nations. As the light's dimmed and the electronic music started to roar over the studio's gargantuan speakers, it became clear that the ceremony was about to get underway. Let's just say it was very Japanese—zany, over-the-top performers (who were notable Japanese personalities) telling plenty of jokes (I think!) and interacting with the eclectic crowd of dancers in a confusing cacophony of sights, sounds and choreography. Even though the lengthy ceremony was clearly intended for a Japanese audience—and therefore wasn't necessarily what I was expecting—it was essentially a string of nostalgic nods to the classic properties upon which the newly revealed attractions are based, and was pretty fun overall. After lunch and a brief wander, the time was nigh to finally get our teeth into one of the new attractions—Detective Conan's Real Escape Game. We were led into a room with a stage, which serves as a sort of holding pen for participants who are about to start the escape game. The stage is set with help from another theatrical performance. A group of actresses and actors clad in bright suits dashed about the stage in a frenzy of comedic Japanese entertainment. This set up the Conan-themed backstory, which is also a prelude to the Detective Conan movie, Zero's Executioner. The theatrical introduction serves to explain where you are and why you need to escape (the tablets which you will use to help solve the game's puzzles also contain an abridged version of the story in English). Eventually you are thrown into the chaos and given one simple task; solve puzzles to escape from the building. The Real Escape Game has all of the classic escape room trappings you'd expect—work as a team, figure out brain-teasing puzzles that become increasingly more difficult (which forces you to think outside of the box), battle against a time limit and so on. However, where this version of the theme park classic stands apart is in the interactive theatrical elements that are woven throughout the escape. While it's all in Japanese (and mostly without translation) it's creates an experience that offers something quite different from other escape room options in Japan. It was a pretty awesome experience, but there are some caveats. The entire event can last up to two hours (a significant proportion of which is essentially a theater production in Japanese), so if you are pushed for time you may want to factor that in. It's also worth bearing in mind that this attraction is actually not included in the park's standard admission, and costs an additional ¥4,980 (or ¥2,550 for children up to 11 years old). But if you're confident in your Japanese ability, love a bit of whacky Japanese theater, are a die-hard fan of the Conan IP or just like a good escape room, it's definitely worth a visit! The next (and final) attraction for the day was the Lupin III XR Ride, a VR car chase rollercoaster! I went into this one relatively blind—so to speak—and I was very pleasantly surprised. My previous virtual reality experiences involved a couple of novelty gimmicks and a little dabbling with consoles, and the Lupin III attraction entirely blew those previous experiences out of the water. It was an absolute blast! You board the ride either solo or in groups of two before placing a virtual reality headset over your eyes, which catapults into the back of master thief Lupin III's car as he and his gang attempt to escape from the police following the heist of a prized key from the fictional Museum of Fortunia. For anyone who has not tried VR, do not underestimate the immersive capabilities of this technology. For all intents and purposes, you have literally been transported to another world for the duration of this ride. The rollercoaster—which hit speeds far higher than I had anticipated—sends you racing up the sides of cartoon buildings and brings you crashing back down to earth multiple times in a ride that had me beaming from ear to ear from start to finish. 10/10, and an absolute must-ride if you find yourself at Universal Studios Japan over the coming months. What Else to Look Forward to in 2019? As mentioned earlier, the summer term for Universal Cool Japan 2019 will also usher in several new "cool" attractions. It will officially commence on May 31, and will finish up on August 25, 2019, so there's a short window of opportunity to experience the best that both the spring and summer terms have to offer at the same time! An immersive show attraction from the classic anime Attack on Titan and a theater attraction from the Sailor Moon franchise will make an appearance this summer. Better yet, they will be accompanied by the first ever collaborative attraction in the history of Universal Cool Japan, in the form a theater show inspired by the worlds of Godzilla and EVANGELION! I'd love to spill the beans on what's in store, but more details will be released on these attractions over the coming months. While Universal Cool Japan 2019 has plenty to offer, the entertainment outlets at USJ extend beyond the reaches of Japanese pop-culture. The Wizarding World of Harry Potter, Minion Park, the Flying Dinosaur Jurassic Park ride, plus an assortment of themed restaurants and souvenir shops are all extra incentives to check out one of the best theme parks in the country! Admission: Standard one-day admission for adults costs ¥7,400 (about $68) and ¥5,100 (about $46) for children, and two-day tickets cost ¥14,700 and ¥10,000 respectively. Click here for more info. Access: Universal City Station is a about a five-minute walk from the park, and can be easily accessed from Osaka Station. Simply jump on the Osaka Loop Line heading towards Nara and then change at Nishikujo Station to the Sakurajima Line. The entire journey takes about 17 minutes and costs only ¥180! Can You Survive USJ's Spooky Halloween Hotel?